Again, the target at 79.67 – 78.15 was passed. The structure is still incomplete, although it is very close indeed. 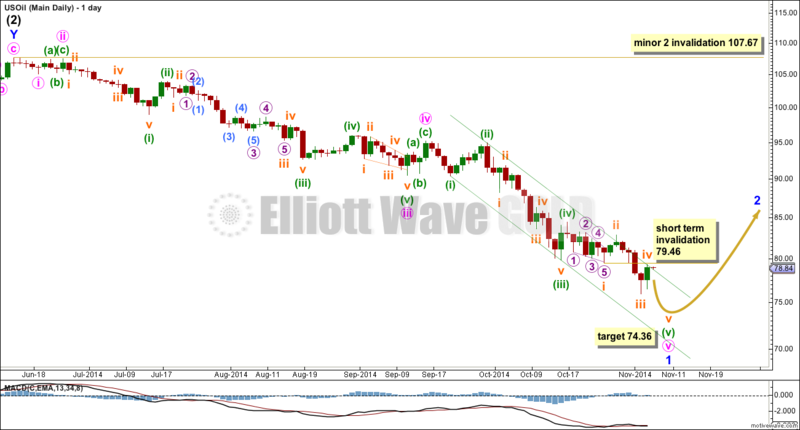 Summary: The new target for this wave to end is 74.36. This may be met within a week. Thereafter, I expect to see choppy overlapping upwards movement for a second wave correction. Intermediate wave (1) down looks like a five wave impulse and intermediate wave (2) upwards looks like a clearly contrasting correction with a lot of choppy overlapping movement. 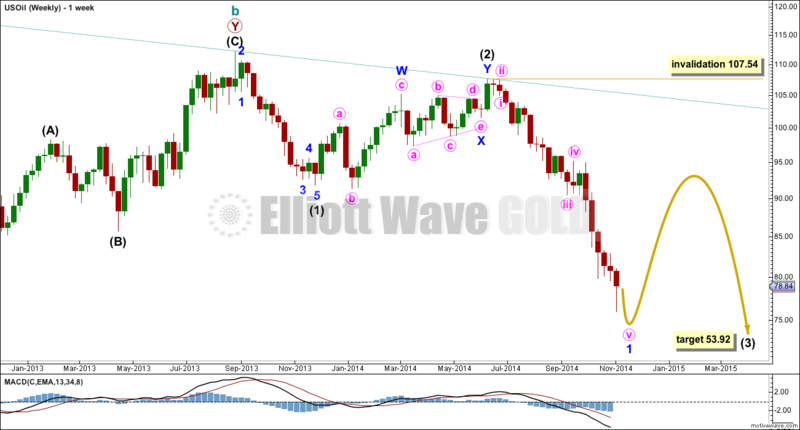 Within intermediate wave (3) minor wave 1 is close to completion. When it is done I will draw a Fibonacci retracement along its length and expect minor wave 2 to end about the 0.382 Fibonacci ratio in the first instance, and the 0.618 Fibonacci ratio slightly less likely. Because this would be a second wave correction within a third wave it may be more shallow and brief than otherwise. Minor wave 2 may not move beyond the start of minor wave 1 above 107.54. Minor wave 1 is ending with a typically strong fifth wave. Within minor wave 1 minute wave iii is 0.52 short of 6.854 the length of minute wave i. Minute wave v may not exhibit a Fibonacci ratio to either of minute waves i or iii. Within minute wave v there is no Fibonacci ratio between minuette waves (iii) and (i). I would expect to see a Fibonacci ratio between minuette wave (v) to either of (i) or (iii). Minuette wave (v) has passed equality in length with minuette wave (i), the most likely ratio for it to exhibit. The next likely ratio is at 75.07 where minuette wave (v) would reach 0.618 the length of minuette wave (iii). Within minuette wave v subminuette wave i is a leading contracting diagonal, followed by a typically deep second wave. There is no Fibonacci ratio between subminuette waves i or iii. At 74.36 subminuette wave v within minuette wave v would reach equality in length with subminuette wave i.
I favour the lower end of this target zone because it is calculated at a lower degree. Draw a channel about minute wave v using Elliott’s first technique: draw the first trend line from the lows of minuette waves (i) to (iii), then place a parallel copy on the high of minuette wave (ii). I would expect minuette wave (v) to find support and end at the lower edge of this channel. When this green channel is breached by at least one full daily candlestick above it and not touching the upper green trend line, with clear upwards (not sideways) movement, then I would take that as trend channel confirmation that minor wave 1 is over and minor wave 2 is underway. While price remains within the channel (whether or not the target is reached, and if it is exceeded) I will assume that the downwards trend continues. In the short term any further upwards movement for subminuette wave iv may not move into subminuette wave i price territory above 79.46. This price point will also provide confirmation of the expected upcoming trend change; whether or not the target is met movement above 79.46 may not be a fourth wave correction within this final downwards impulse, and so movement above this point should indicate a trend change at a larger degree. US Oil moved slightly below low target at 74.36 and seems to be consistently breaking below low targets. Depending on which data feed is used US Oil did or did not breach upside barrier at 79.46 a few days ago. Would be very interested to see an update on US Oil if /when you have time. Yes, except USOil invalidated my wave count first; subminuette wave iv moved above 79.46 into subminuette wave i price territory. So that means it was not a fourth wave, it was another second wave, and price should keep going lower. I need to calculate new targets, again! I won’t be able to do it this weekend though, I’m not at home. I’ll be back Sunday evening (NZ time) so may throw a chart up then for you. Lara, knowing you see the wave count was invalidated is a big help.